Among the great glories of Hollywood's film production during the 1940s was (and still is) its outporing of singing, dancing (mostly in Technicolor) musicals about show biz. Many of these films followed a basic plotline in which a group of young theatrical hopefuls found itself pulled apart by the ups and downs of theatrical fortune, not to mention the onset of a world war, and often a romantic entanglement with a glamorous outsider, before at last being reunited and reconciled in time for a happy ending at the final fadeout. The sparkling world of these movies comes to life again in THE GREAT AMERICAN BACKSTAGE MUSICAL, recreated by a hard-working cast of 6 who take us from Greenwich Village to wartime London, to the battlefields of World War II and back to New York again in one movie- length act and fifteen musical numbers. In the late 30s, the rumbles of World War II were sounding around the world. While America was recovering from the Great Depression, Europe saw the shadows of Hitler and Mussolini strut across the continent. That era produced a particular type of movie - the backstage musical. Written as show entertainment, the genre traced the trials and tribulations of countless struggling writers and artists, who were elevated, virtually overnight, to the dizzy heights of fame and stardom. These artfully simple stories were staples of Hollywood in those strife-torn years. This show is an affectionate look over the shoulder to a time when the world turned at a slower pace, or so it seemed, and every cloud had a silver lining. This show is a delightful pastiche of the period filled with melodies that remain infinitely hummable. The action opens backstage at Johnny's Bar in Greenwich Village. For full plot summary, consult nodanw.com. A longer unpublished two-act version of The Great American Backstage Musical is also available. Its narrative contains several new numbers and new scenes. 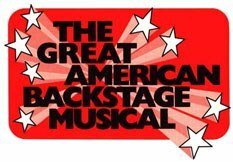 "Los Angeles has a new smash hit, The Great American Backstage Musical. The book by Bill Solly and Donald Ward is brilliantly done. Bill Solly's music and lyrics are fresh and biting." "Solly and Ward's show does spoof the old days, but it plays so affectionately that it almost seems to be sighing for them. The audience goes in prepared to hoot and finds itself strangely touched. This is a show with a future." "So enjoyable it may give nostalgia a good name. Music and lyrics by Bill Solly are impeccably and dottily elegant." "A smart small swell little show." "Bill Solly's songs are not only beautifully imitated from 1939 music; they would have rated high in it." "Recreates the age of jitterbug, torch song and Broadway vaudeville in a series of numbers that land right on target. The lyrics are often metrically ingenious, and the music is at once very knowing and bursting with exuberant innocence. There are no duds." "Lush tunes… Bill Solly's songs are never banal. Solly and Ward wisely avoid the gee whizz school of musical comedy. This show not only has a heart but, more importantly, a soul." "Entertainment pure and simple. You get involved with the characters and you are always entertained. The score is not only refreshing, it is just plain wonderful." "Bill Solly and Donald Ward, co-authors of the long-running Boy Meets Boy, genuinely love the vintage shows they spoof, and skillfully lampoon the old-fashioned formula musical. Bill Solly's songs are clever enough to invite rip-roaring comic performances."